PRODUCT RATING Delicious. Factory-made baked goods from the major chains (Maxims, etc) just can’t compare with the warm taste of fresh-from-the-oven buns made by your neighborhood baker. GREEN RATING Quite Green. Neighborhood bakeries don’t pre-package their buns in plastic bags, meaning you can bring-your-own-bag (BYOB). Switching to locally baked buns also reduces air pollution. Explained below. Walking around Hong Kong, you see bakeries literally on every block. This makes getting a tasty bite to eat very convenient. However, due to the unsustainable practices of the major bakery chains, there is a very heavy cost inflicted on the environment. In 2009 (when the plastic bag levy came into effect), bakeries were responsible for 262 million plastic bags ending up in the landfill. A year later, that increased to 370 million bags, an increase of 21%. The ineffectual plastic bag levy exempted many retail categories, including bakeries. Seeing the writing on the wall, many bakery chains decided to “pre-package” their buns in order to circumvent the anticipated future expansion of the bag levy to the previously excluded categories. This is an example of a well intentioned, but poorly executed legislation causing more harm than good (we need a levy on ALL plastic bags). 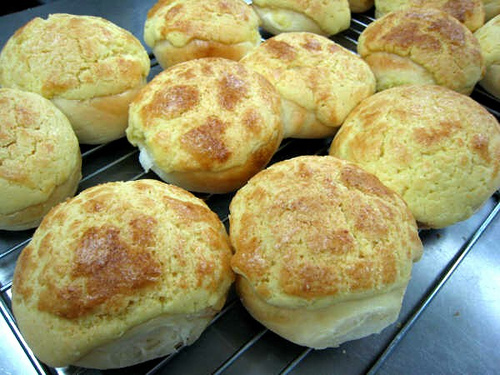 Most bakery chains in Hong Kong do not produce their baked goods on site. They are produced in factories and then delivered all over Hong Kong. This business model reduces cost and allows the chains to capture economies of scale in production. But the taste of factory made buns just can’t compare with ones freshly out of the oven from your neighborhood bakery. The buns at some of the chains taste like they are made of sugar-coated cardboard. For me, nothing beats a warm, fresh-from-the-oven bun. This centralized production model results in delivery trucks driving around Hong Kong every day adding to our already dismal air pollution. In contrast, your local neighborhood bakery probably has ingredients delivered once a month, resulting in a lower carbon footprint and reduced air pollution. 1. Buy from your neighborhood bakery that bakes its goods onsite. This will support local enterprises while also reducing air pollution in Hong Kong. 2. Bring Your Own Bag. Much of the dried goods we purchase, such oatmeal, cereal, noodles, or raisins come in plastic bags that can be easily re-used. Try carrying one in your purse or bag. They are light and take up no space at all. When you go into the bakery you can just hand it to the cashier and tell them you’d like your bun put into your own bag. You’ve now reduced the number of single use bags filling up our landfill. 3. Avoid the worst offender bakery chains listed below. A 2011 study by Greeners Action, shows that these are the worst offenders when it come to packaging. They all individually pre-package their buns, while some also take the completely redundant step bagging it again when you bring it up to counter. 4. If you don’t have local bakery in your neighborhood try one of the relatively greener chains listed below. According to Greeners Action, they do not pre-package their buns and also do not individually bag each bun when you bring it up to counter.